B7K Ultra v2 Bass-Preamp vor, der wie die 2017 B7K Ultra klingt aber jetzt mit Kopfhörer-Ausgang und eine Speakersimulation an Bord hat. Über USB können dann neue Impulsantworten geladen werden. Ultra-Ausführung sind ein Master-Volume Regler, eine Fusschalbar Distortion und zwei 3-Wege Schalter für die Wahl der Mittenfrequenz der Hi-Mid und Low-Mid-Regler. Die bekannten Features des B7K Ultra, wie etwa der 4-Band EQ, der DI-Ausgang sowie der Attack und Grunt-Schalter gehören ebenfalls zur Ausstattung. Blend : Mixes the clean and processed signals. The clean signal remains at unity gain while the volume of the overdriven signal is set by the Level knob. Level : Sets the volume of the overdriven signal. Grunt Switch Sets the amount of low frequency content to saturate by selecting between three different bass boost levels before the clipping stage. Attack Switch Sets the amount of treble content to saturate: The "Boost" setting emphasizes the treble content extra clarity and presence. Direct Output XLR with Cab Sim. Toggle the cabinet simulation on/off on the Direct Output. Headphones. Alpha·Omega Ultra has an internal stereo headphone amplifier capable of driving a minimum load of 16 ohms from the 3.5mm stereo jack. Micro USB. 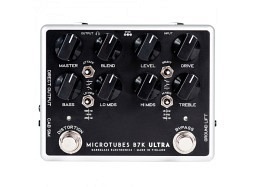 A Micro USB B connector allows you to connect the pedal to PC/Mac to load cabinet simulation impulse responses to the pedal and control various other settings.